Combine hacienda-style design with fresh colors, large spaces, manicured grounds and a central Scottsdale location and you have The Scottsdale Resort at McCormick Ranch, A Destination Hotel. Not a new property, this resort has been on the radar for conferences and conventions since 1976. With a major renovation that was completed in 2015, The Scottsdale Resort maintains that reputation for excellence in conference facilities, but additionally embraces its place in the community as a destination for locals to enjoy the bar and restaurants and make this a place worthy of consideration for staycations for area residents as well as a vacation destination resort for tourists. With the 2015 renovation, the outdoor spaces shine. Some are lush and grassy, some are more suited for outdoor dining banquet events, some are designed for small group socializing. With cooperative weather most of the year, it seems that one emphasis of this remodel was to invite guests to embrace the outdoors. Success! There are a total of 326 guest rooms and suites, many of which have lovely golf course, pool or garden views. At the main pool, 20 first floor rooms have private patios with convenient pool access. At the Stillman Building, all first floor suites have outdoor patios just off the Stillman pool. While the resort now sports modern hues and classy bar and dining options, the history of the property has not been discarded. You'll find photos and plaques scattered throughout, in homage to the legacy of the original owners, Ann and Fowler McCormick. Established as a cattle ranch and their winter home, Anne was enthralled with Arabian horses and developed an equestrian center on the property. This was the original site of the Arabian Horse Show. That tradition continues; the Scottsdale Arabian Horse Show is an annual event attended by thousands, many of whom travel from afar not only to compete, but also to appreciate these beautiful animals and the people who work with them. The Scottsdale Resort participates in many "green" initiatives, and environmental impact considerations are given to all purchases equipment, lighting and recycling. As a participating member of Clean the World, soap and shampoo products discarded by guests following their stays are donated to Clean the World, which delivers them to domestic homeless shelters and impoverished countries. Whether you are attending a conference, have a group of guys on a golf vacation, or are just a couple enjoying some Scottsdale leisure time, The Scottsdale Resort has amenities to make your stay a pleasant one. At the Luna Spa a variety of massage and body treatments will refresh both mind and body. At the Fitness Center, open 24 hours per day, you can work out with cardio, free weights and strength training equipment, and head to the sauna. Soak in that Scottsdale sun while you cool off in one of the two heated outdoor pools. At the McCormick Pool, rent a cabana for the day, and have an adult beverage and some nachos or a sandwich and salad at the Twisted Vine Pool Bar & Grill. At lunch, we chose to eat in the snazzy Bar Six40, named after the number of acres of land that Winfield Scott purchased that would later become Scottsdale. I ordered the small Fire-Roasted Cobb Salad (it was not small!) and it was delicious. My cohort ordered the Brisket Burger, two patties with beef brisket in between, with bacon. Wow! I dared him to finish it, and he was up to the challenge! Two great choices. Both items we ordered for lunch also appeared on the Kitchen West menu; if you had a difficult time deciding between two items at lunch, you might find them on the dinner menu! The premier dining spot at The Scottsdale Resort is Kitchen West, serving seasonal menus of traditional and unique dishes inspired by the American West. Foods are sourced from regional farms, ranches and fisheries located in the western half of the country, where possible. The menu isn't huge. You may order seafood, steak and sides, or go more casual with a burger, a salad or even an egg dish. There are a few dishes for the health conscious/vegetarian in your party. If you like an appetizer with afterburn -- and I do -- I highly recommend the Chili Shrimp & Grits. Thumbs up for the Copper City Bourbon Sea Scallops with Persimmon Succotash, my choice (and healthy!). My guest chose the 8oz filet mignon, prepared perfectly. Note that the succotash was really mixed vegetables and not traditional. The specialty dessert was a cobbler -- but I'd rather have another portion of Shrimp & Grits, thank you! The environment at Kitchen West is resort casual. The open kitchen and comfortable dining room are pleasant and welcoming. The seating is adequately spaced between tables. The Scottsdale Resort is immediately adjacent to the McCormick Ranch Golf Club, with 36 holes of championship golf. Your concierge can arrange a tee time for you at a preferred rate and resort transportation will shuttle you there. I have never been to a perfect hotel or resort. Because everyone is different and travels differently, features that appeal to me might not be important to you, and vice versa. Here are some thoughts about my stay at The Scottsdale Resort at McCormick Ranch. The Scottsdale Resort at McCormick Ranch has long been positioned as a conference resort. While conference and meeting space surpasses most other local resorts, the 2015 renovation focused special attention on making the resort more attractive, more esthetically pleasing, more comfortable and more welcoming to locals and tourists who want a less boisterous, more relaxing Scottsdale resort experience. There are plenty of spaces for socializing. Indoors, the lobby lounge and BarSix40 were busy places. Outdoors, there are a variety of courtyards and gathering spots to relax, enjoy a sunset or a lovely view. Most of the guestrooms are in the main McCormick Building, surrounding the main pool. The building is three stories high. The Stillman Building is the farthest from the main building action, but you'll only walk about the equivalent of a block to get to the lobby. While the resort is certainly in the desert (all of Scottsdale is!) you'll find lush greenery and gardens here, too. There is a large quiet pool, and a smaller, quieter pool! For wedding and other non-business groups, I highly recommend booking the Stillman Suites around the smaller Stillman Pool and leave the larger pool to the convention and meeting attendees! This resort is slightly off the beaten path. You probably won't be walking to any attractions or restaurants nearby, but this location is very central and within a few miles of many dining and recreation options. There is a shuttle that transports guests to shopping, restaurants and attractions within a five-mile radius. Of course, it is subject to availability, so you might have to wait ten minutes or so for the next shuttle. This is a pet-friendly resort. Like most resorts in Scottsdale, this one charges a resort fee in addition to the room rate, but it not as steep as most. It includes wi-fi in the guestrooms, newspapers, postage for postcards, and use of the bicycles, subject to availability. At BarSix40 you can grab a quick cup of coffee or continental breakfast items if you don't want a full-service breakfast. Guests of The Scottsdale Resort get preferred rates at McCormick Ranch Golf Club, which is right next door. Looking for a place to host a wedding, reunion or other special event? Don't overlook the Scottsdale Resort at McCormick Ranch. This resort offers very reasonable 'not-your-typical-Scottsdale' rates. Goat's Milk Caramels from The Simple Farm in Scottsdale? More please! Don't expect resort-led hikes, trips, tours or activities. They will direct you to where you can find nearby recreational opportunities, but you won't find many classes or activities organized by the resort. Children always enjoy a swimming pool, but there is no kids camp, no game room, nowhere to drop off a child for supervised fun. No refrigerators in the standard guestrooms? The Luna Spa is small, and provides the basic body treatments and massages. There is no salon here. Most of the self-parking was on a second level accessed by stairs only, no elevator. There is additional parking around the perimeter of that building allowing people to avoid the stairs, but you might end up with a long walk to the lobby. There is a parking area near the Stillman Building rooms. The second floor rooms in the Stillman Building are smaller (and priced accordingly). They do not adjoin to the suites below them. The bathrooms in the renovated guestrooms have been modernized as much as was feasible, but are still relatively small, with tubs and shower curtains. Tubs may be a plus for some people! Since large conferences are often held here, if you are not participating in that convention you might try to find out what kind of group it is in advance. Anytime a very large group books a convention, there might be a tendency for them to take over the facilities and hijack the attention of the staff. The resort is located about 17 miles (less than 30 minutes) from Phoenix Sky Harbor International Airport. Coming from the north, take the Via de Ventura Exit and head west to Hayden Road. At McCormick Parkway, turn right. The Scottsdale resort will be on your right. Coming from the south, take the Indian Bend Road Exit and head west to Hayden Road. At McCormick Parkway, turn left. The Scottsdale resort will be on your right. See the location on a Google Map. These attractions and activities are within about five miles of the resort. Note: The Scottsdale Arabian Horse Show takes place at WestWorld of Scottsdale, about 9 miles north of the resort. As is common in the industry, the writer was provided with a complimentary meal for review purposes. While it has not influenced this review, About.com believes in full disclosure of all potential conflicts of interest. For more information, see our ethics policy. All prices and offerings mentioned herein are subject to change without notice. May 2016. During summer 2015, the resort'’s 54 king rooms were completely renovated, 76 of the double-queen rooms were converted to king rooms, and all rooms in the main building were renovated. Pictured here, the King Bedroom in the main building (McCormick Building). Pictured here is one of many outdoor spaces at The Scottsdale Resort. This firepit seating area has a golf course view. The resort isn't only about business meetings; this is just one example of relaxing and romantic gathering spots that have been added. The lobby is attractive and comfortable. Both groups here were having meetings. That's so much nicer than conducting business in a hotel room! Factoid: This resort was originally designed by Scottsdale architect Bennie Gonzales, who also designed Scottsdale City Hall, Scottsdale Center for the Performing Arts and the Scottsdale Civic Center Library. Bar Six40, the lobby bar, and Twisted Vine Pool Bar & Grill at the McCormick Pool are all managed by the same Executive Chef and offer abbreviated menus of Kitchen West. The KW Smoked Brisket Burger, pictured here, consists of smoker to slow-cook brisket sandwiched between two thin Angus ground beef burger patties, with accoutrements. I'm glad that I don't live close enough to the resort to stop by for lunch a few times each week to order this burger. Oh, so bad, but oh, so good. This event space, one of many, is suitable for a cocktail party or a formal dinner. 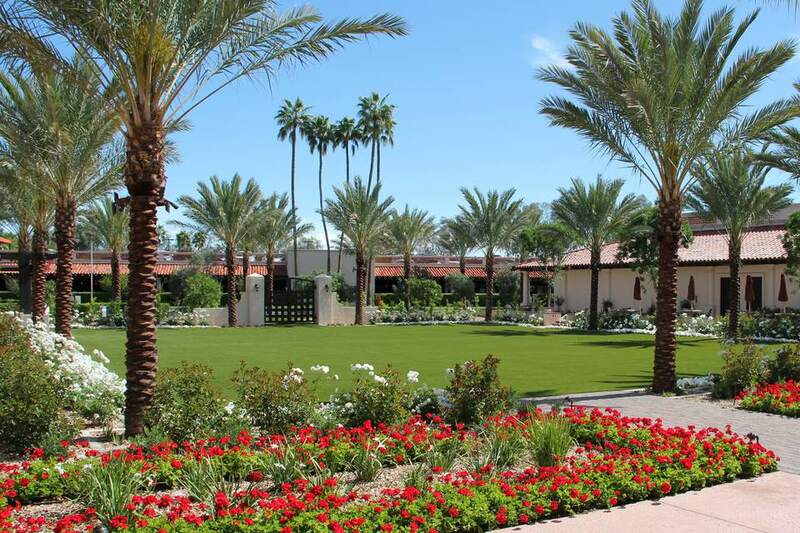 The Scottsdale resort has 100,000 square feet of indoor and outdoor meeting space​. ​This resort can accommodate up to 600 people for an outdoor reception.